FORE School of Management, the Delhi based premium Management School, has extended the applications for the admissions in Post Graduate Diploma in Management (PGDM) for the upcoming 2015-17 session. The last date for submitting the applications now is December 15, 2014. In order to encourage cultural diversity, a special weightage of 5% (over and above 100%) is offered to students from the 7 North-Eastern states, Jammu & Kashmir and South India (namely Tamil Nadu, Kerala, Karnataka, Andhra Pradesh, Telengana and Puduchery). Present batch is highly diverse in terms of gender (34% female students), academic background, and work experience. For the past three decades FORE has successfully created a niche in the management education and is consistently ranked among the top most B Schools of the country including CRISIL with a rating of A***, the highest for educational institute providing post graduate studies. 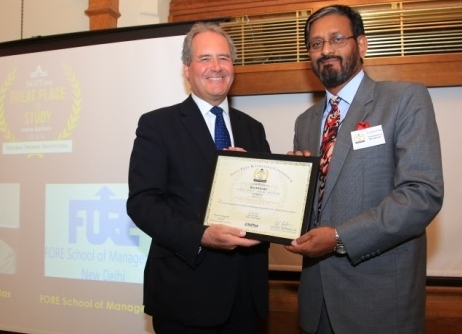 Recently, FORE was recognized by SkillTree Great Place to Study, at The House of Commons, London. Entrepreneur. Over 16 years of versatile experience in Knowledge Management, People, Process & Technology, Productivity enhancement. Partnering academia in facilitating excellence in learning & leadership in education, content management, online business simulation based learning initiatives, faculty.